Are you tired of hearing your son complain that he is bored with the many toys in his room? Do you dread your daughter's birthday, knowing that whatever toy you buy her she'll toss aside in a week without a second thought? If this sounds like you, then K'NEX is the answer to your problems. K'NEX, well-known as the distributor of the famous Lincoln Logs, has created the next generation of construction sets. K'NEX inspires creativity in your child, building self confidence as he or she succeeds in building a roller coaster or car, and encouraging interaction among children and parents as they build together. K'NEX products are manufactured in the states but are distributed internationally, allowing you to get your children some K'NEX wherever you may be. K'NEX are built to be safe and educational. K'NEX will delight the senses of sight and touch at every age. You'll see this yourself as you watch your child see his or her creation come to life. And K'NEX are parent-approved. K'NEX has received over 200 awards from kid and parent testing panels and won the Creative Child Award and the SheKnows Award. With amazing endorsements from both children and parents, you know you can't go wrong by adding K'NEX to your children's toy collection. K'NEX provides something for children of every age. If you visit the K'NEX website, you'll find a great section for toddlers. This section includes large building blocks that create farmyard and ocean scene when put together. It also includes building blocks to create scenes from Sesame Street. K'NEX provides pictures and videos of each item, so you'll know exactly what the item will look like when it is put together. For older children, you'll find construction sets for roller coasters like the Cosmic Twist and the Rippin' Rocket. Each set comes with a specialized motor to launch the coaster when the track is complete. The sets come with 500 individual pieces that create 20 or more feet of spirals, twists and loops. If you decide to go with the Light Up Ferris Wheel, your child will enjoy the exciting lighting effects that can be customized with a push of a button. If your child doesn't like roller coasters, don't worry. Model NASCAR cars are available that are scale replicas of the real race cars, down to the authentic paint schemes and sponsor logos. They even include a figure of the actual racer for each car! If you want to get your child something different, fun, and educational, then K'NEX is the place for you. Visit the website today to get your child something he or she will enjoy for years to come. 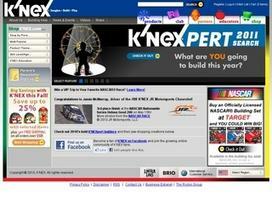 Share what you think about K'NEX, and your favorite ways to save there! Shipping was SO expensive, we choose to buy less. I love them i am a hands on type of guy and i need things to keep my mind going and knex is just the thing to do that. i have had them for years and they never get boring.